Tucson, AZ, November 30, 2016 – 4D Technology Corporation, manufacturer of optical metrology systems, has introduced the adjustable Surface Isolation Source (SIS) for its AccuFiz Fizeau laser interferometers. Plane-parallel optics are transparent components with parallel faces, or optical systems with two or more parallel surfaces. Measuring plane-parallel optics with a laser interferometer can be challenging as the parallel surfaces all contribute interference fringes, making measurement extremely difficult or impossible. The Surface Isolation Source is an optional, external laser source for 4D Technology AccuFiz Fizeau interferometers. The fiber coupled source excludes all but the surface of interest, making it straightforward to measure flat, transparent optics with physical thickness as thin as 200 microns. In a single setup both the front and back surfaces of an optic can be measured, without repositioning. Transmitted wavefront error, homogeneity and optical thickness can then be obtained from a combination of measurements. The adjustable path match mechanism provides additional flexibility, enabling the operator to quickly select and optimize fringe modulation for any surface that is within a 20 millimeter measurement zone centered at 100mm in front of the aperture. The SIS module significantly augments the functionality of a standard AccuFiz by making it a dual source device. Selecting the SIS module input permits measurement of plane-parallel optics. For other optical test optics or configurations, the operator can merely switch to the internal long coherence HeNe source and use the AccuFiz as a conventional interferometer. 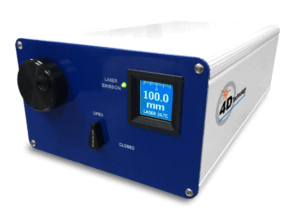 AccuFiz laser interferometers offer an unmatched combination of performance, quality and value, for accurate, repeatable measurement of surface shape and transmitted wavefront quality. 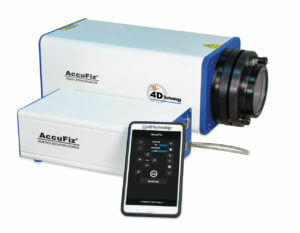 The AccuFiz is extremely easy to use in confined lab spaces. Its compact, lightweight design is extremely rigid for maximum stability in any orientation or environment. Wavelengths from 355 nm through 1.064 microns, apertures from 33 to 800 mm, and horizontal and vertical mounting configurations, provide the right options for a wide range of applications and budgets.